Hi Inga! I was restocking on wine last night (can’t beat the 20% 6 bottles deal), and I started wondering about the flavors descriptions on the labels. Since wine is usually just made with grapes, how does it pick up flavors like pepper, mocha, blackberry? Is it infused with these flavors, or do they develop during fermentation? Are winemakers able to predict the flavor profiles? Also, who are the people that taste and decide what flavor profiles are presented in the wine, how are they trained, and how much would they have to drink before figuring it out? I’ve read your posts on wine tasting, but I’m curious how the flavors get in there, and how the pros decide what to put on the bottle. Thanks much! I think MI cupcake did a fine job of articulating the questions that we all ask in our own minds when standing in the wine store and reading the label that says the wine tastes like tobacco and strawberry flavors. Terroir can be simply defined as “a growing environment”. It’s the specific place where something grows that makes the something that grows there taste like it comes from there. We often talk about “Idaho potatoes” or “Nebraska corn” or “Washington apples”. What makes “Idaho potatoes” so famous and well-known? At some point, it became clear that Idaho potatoes tasted like Idaho potatoes and not California potatoes. They stood out because there was some unique characteristic of the growing environment of Idaho that made those potatoes so darn good. It includes the climate in that area (rainfall, humidity, fog, etc), the amount of sunlight and/or cloud coverage, what the ground water is like, the slope of the land, and the soil. 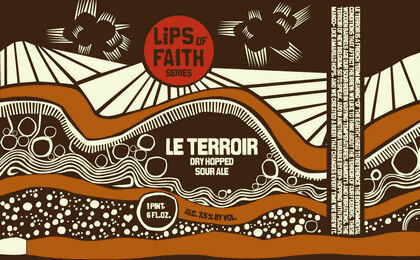 A great visual of terroir from the Le Terroir label from New Belgium Brewing Company beers. Grape vines (and their grapes) are especially sensitive to terroir. Pinot Noir grapes from Napa Valley will have different characteristics compared to those grown in France. They are genetically the same grape, but because of the differences in the terroir, the grapes taste more like “Napa Valley Pinot Noir grapes” instead of “French Pinot Noir grapes”. Napa Valley Pinot Noir typically has rhubarb and floral flavors, for example. French Pinot Noir typically has cranberry and peppery flavors. These are just common characteristics of one region vs another. And from what I keep hearing, if you really take your Wino title seriously, and drink lots and lots of wine, you will start to identify the characteristics in wines from specific regions. 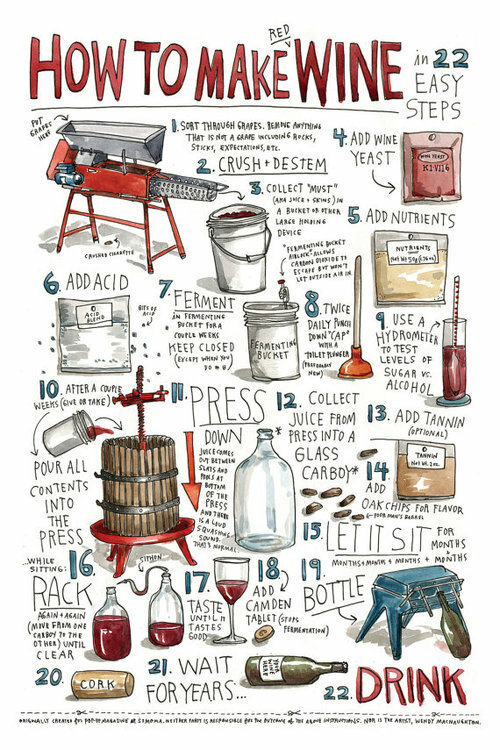 How To Make Wine poster. Looks kinda hard. I think I prefer drinking it. Another key influence on the flavors of wine is the fermentation process. Alcohol fermentation is the chemical conversion of sugar and yeast into ethyl alcohol, carbon dioxide and other compounds. And guess what… it’s those ambiguous “other compounds” that are such a big piece of what makes wine so darn interesting to smell and taste. Get this, Winos. There 8,000 to 10,000 active chemical compounds in wine. And each and every one of those may invoke a different flavor or aroma. Just for the sake of comparison, imagine the deliciousness of a steak. That hunk o’ meat has only 120 active chemical compounds. 120 compared to 10,000!! This little fact helped me put things into perspective as to why you never think, “hmmm, this steak has a hint of blueberries.” But with wine, you might! One or more of those 10,000 compounds could invoke the flavor of blueberries while you are drinking that fermented grape juice. In addition to alcohol fermentation, wine often goes through malolactic fermentation, which, contrary to its name, is not actually a fermentation process. It is the transformation of malic acid and bacteria into lactic acid, carbon dioxide, and (again) other compounds. Malic acid is a naturally occurring acid in grapes that can give the tart flavor of granny smith apples. (I can sense your salivary glands suddenly being activated.) Lactic acid can calm down the excessive acidity in malic acid and even give some wines that “buttery” flavor (often tasted in Chardonnays). So basically, the “other compounds” that are a result of both alcohol fermentation and malolactic fermentation create the incredibly complex and vast amount of flavors in a single mouthful of wine. Those chemical compounds could make one taste a number of various flavors. Which is why personal experiences are a critical part of tasting flavors in wine…. Finally, personal experiences play a big role in what YOU are tasting when you taste wine. We all live in a world of smells and flavors and tastes. And our brains recognize those smells and flavors and tastes and relate them to memories. And they trigger specific memories or even mentally transport you to the place where the memory is locked in your brain. For example, for me the smell of fresh raspberries always reminds me of my grandmother. And when I walk by dusty sidewalks being hosed down, I am transported to a specific morning I spent while traveling in Vienna. The brain is so cool. Anyway, when you sip a glass of anything with 8,000-10,000 active chemical compounds, something is going to trigger some memory or familiar flavor or experience. But that doesn’t mean it is easy to sense. We don’t really exercise that part of our brain or often articulate what something smells like. You don’t state aloud that bread in the toaster smells like toast. You just know it does. So when you sip on a glass of wine, it may trigger a certain flavor but it is often hard to identify it and pinpoint it to what that flavor is… mostly because you’re not used to saying it aloud. And when you and I take a sip of the same glass of wine, those compounds may trigger a different experience or memory for both of us. So you may smell or taste fig while I taste bacon. And it’s not wrong either way. This is your brain on wine. When you read a label on the back of a bottle of wine, it will often give a flavor description. These flavors are typically present in the wine – they may be commonly identified by a large group of people. But just because you don’t taste them doesn’t mean that you’re wrong. The good news is that you can start exercising the part of your brain that relates smells and tastes to words. All you do is have a sip and start describing – as best you can – what you taste. The more you do it, the more you’ll be able to do it! (1) Terroir (the growing environment of the vines) make wines taste like the wine of that growing area. (2) Fermentation results in 8,000 to 10,000 active chemical compounds in wine which are basically responsible for the flavors and aromas in wine. (3) While you are experiencing the flavors of those active chemical compounds, you’re not used to verbally expressing what you are smelling or tasting. And your personal experiences and memories may lead you to taste something different from someone else. So Winos… hold that glass with your head and pinky held high, and state with confidence that you smell mothballs and taste leather in this glass of Cabernet. Own it. You can’t be wrong! Excellent article. You took some complex info and made it really concise and approachable. Thanks for the kindly feedback, SAHMmelier! My personal favorite description on a bottle was “asphalt”. Who wants that?? Oooh…. a wine Prezi. Just the thought of it is making me think I should have painted a white board wall in my office.